We’ve been advertisers in Hyde Park Living and Palma Ceia Living magazines (really nice full-sized glossy magazines) since they were first published a few years ago, as these are two of our favorite south Tampa neighborhoods. When I mentioned a recent project to the magazine director, Bradley Hassen, she very nicely offered to do a feature article in the magazines. The project highlighted is a two-story garage-apartment recently built in the Historic Hyde Park neighborhood. 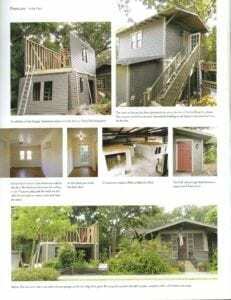 The article appears in the February issue of Hyde Park Living and will also be in the March issue of Palma Ceia Living. The magazines are mailed to residents of each neighborhood. Click on the link below to see the article in better detail. For advertising info for your own company, contact Bradley Hassen at 813-494-0130. While this building will not be on the upcoming Historic Hyde Park Home Tour on February 28, Historic Shed will have a booth there and you can see the exterior of the two-story garage-apartment from the street, in between touring the fabulous historic homes. Stop by the booth and we will give you the address.